Republished from Mordy’s Real World Illustrator Blog. Original post date March 7, 2007. Mordy’s got a bunch more useful posts, check out his blog. [Mordy] found this question posted on the Illustrator World forums and thought it would be cool to share a tip along with some helpful information. I have an image with a brown rectangle for the background, a lake on top of that, and then some text. I would like the rectangle to have anti-aliasing turned off and keep anti-aliasing turned on for the text. The issue is, when I post the rectangle up on a website with a brown background, the rectangle’s border has some anti-aliasing to it, creating a white border around the image. First, the anti-aliased artwork setting in preferences applies only to how Illustrator displays graphic on your artboard in Preview mode. It doesn’t effect how graphics are exported in Save for Web (or any other method). Although theoretically, you could disable anti-aliasing and take a screenshot of your artboard in Illustrator and then open the screenshot in Photoshop… but that would only be a useful method when you’re being paid by the hour. Secondly, there is indeed a way to turn off anti-aliasing on a per-object basis. 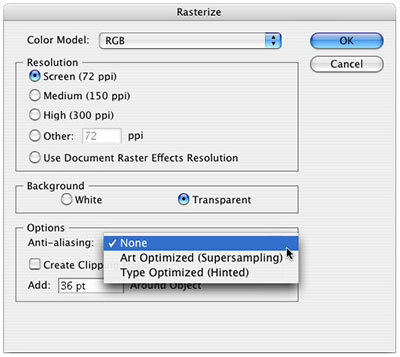 Select your object and choose Effect > Rasterize. In the Rasterize dialog box, set anti-aliasing to none. Since the effect is a live effect, the object is still completely editable as vector art, yet it appears as though it has been rasterized without anti-aliasing. And it will export just as you see it on your screen (of course, you’ll want to always use Pixel Preview mode when working with web graphics). This entry was posted on Friday, January 30th, 2009 at 4:00 am	and is filed under Best practices, Charting, Design, Promote, Software. You can follow any responses to this entry through the RSS 2.0 feed. Both comments and pings are currently closed. this is the best thing I’ve EVER seen. thank you so much! !